Costumes made or purchased in the first six months of 2011. The oldest stuff in my gallery, mostly. 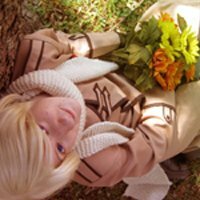 Cosplays from 2010, when I first started out. Cosplays from the second half of 2011. More homemade, less storebought cosplays than before. Hopefully the quality will only get better and better! Bits of outfits that aren't done yet, or progress shots on the stuff I'm making in general.